Number one contender in the World, Dmitriy Salita of Brooklyn, NY lands in the United Kingdom this week ahead of his World title clash with Britain’s Amir Khan. Dmitriy has been waiting for his shot at the WBA World Light Welterweight Title for over a year and now that his time has come intends to take it. World number one contender Dmitriy Salita will be sparring Londoner Ashley “Treasure” Theophane to stay sharp whilst he tones down his training in anticipation of his clash with Amir Khan. Ashley has just come back from training camp with European title holder Paul McCloskey and is currently sparring WBC number 3 Ajose Olusegun said ”It feels good to be appreciated by my peers as they requested my skills to help them get ready for their fights, it feels good to be part of Team Salita again. I will be happy for him when he wins his World Title as he has flown me to America a few times to help him get ready for his fights so I have witnessed the sacrifices he has made first hand ”. Dmitriy has twice flown Ashley to America to help him prepare for his fights. Once in 2007 to Florida and in 2008 to New York. In total they have been in training camp four times, Catskills, Poconos mountains in Pennsylvania, Florida and New York. Amir Khan intends to keep his title but the WBA title has moved from fighter to fighter in recent years so history is not on Amir Khan’s side. From November 2005, no WBA Champion has retained this title on his first defence. 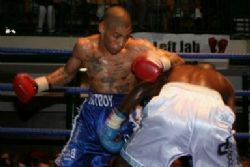 Carlos Maussa knocked out champion Vivian Harris then Ricky Hatton knocked out Maussa. Ricky then vacated the WBA Title to avoid fighting on a Frank Warren promotion. Souleymane M’baye who signed with Frank Warren, fought for the vacant WBA Title beating Raul Balbi in five rounds. Welshman Gavin Rees would go on to beat M’baye in Cardiff. Andreas Kotelnik would wear down and knock out Gavin Rees. Dmitriy Salita was due to fight Andreas last year on the under card of Joe Calzaghe and Roy Jones Junior at Madison Square Garden which he flew Ashley out to America to help in his title charge. Andreas Kotelnik pulled out of the fight accusing Square Ring promotions of offering a scrooge like purse. Dmitriy Salita had worked his way up to the number one slot but Frank Warren came with his big bag of money and tempted Andreas with a showdown with 135lber Amir Khan who stepped up to the 140lb limit after claiming in 2008 that Andreas Kotelnik was the weakest Champion out there. So Team Khan worried how Khan’s chin would stand up to the likes of Lightweight champions Juan Manuel Marquez, Joan Guzman, Edwin Valero and Paulus Moses opted to move up and fight the weak link of the Junior Welterweights. It paid off and Khan is now Champion but he now has number one contender in the World Dmitriy Salita and the winner will have to fight the interim WBA Champion Marcos Maidana who has 25 knockout wins from 26 wins. He has power that has put many of his opponents to sleep so the winner has him to face so losing for Amir Khan may not be such a bad idea as his whiskers are not the most reliable in the World of boxing. Dmitriy has his own documentary out about his life “Orthodox Stance” which has been shown on the BBC in Britain and hit the movie theatres in America. The DVD is now on sale on Amazon. Last Friday Dmitriy was a guest on the NBC chat show Carson Daly so beating Amir Khan will firmly put him on the map. Dmitriy basically told his story, as an up and coming boxer fighting for a title who is also an Orthodox Jew. His unique story retells the classic American dream of rags to riches and his love for America. He will be flying the flag for America when he steps in the ring on December 5th against Amir Khan. Dmitriy was a guest at the White House in Washington DC for a Jewish celebration whilst war monger President George Bush was in power and he was delighted with that meeting. Another Jewish boxer Yuri Foreman must be a great inspiration right now to Salita as he just won the World Title from Daniel Santos on the Miguel Cotto/Manny Paciquao under card. So the Jewish boys are back in town and looking to bring boxing back to the Glory days of the 1930s when Jewish boxers where some of the best around. Ashley "Treasure" Theophane is in US magazine Urban Ink this month with a six page spread discussing his life, ambitions and tattoos. He is the first British athlete, musician or entertainer to feature in the magazine. Dmitriy does a lot to inspire Jewish kids around the World and Ashley is following in his foot steps as he has a 2010 Calendar out now which some of the top UK models supporting him to raise money for Cancer Research UK, The British Heart Foundation and All Stars Boxing Club.